There is so much to find out about the Forest: the iconic ponies, rare and secretive wildlife and unique traditions and way of life. On our introductory walk you’ll explore and discover what makes the Forest special, such as how the animals shape the Forest and how it has survived since the days of William the Conqueror. A guided walk into the Forest to search for the rare and secretive wildlife that lives within! Depending on the time of year and what may be about, we will guide you to the spots where you have the best chance of seeing wildlife such as red deer, fallow deer, butterflies, bird life and reptiles. Our guides have been working in the Forest for many years and have an intimate knowledge of its habitats and what makes it tick. A guided walk returning just after dusk, with the opportunity to look and listen for New Forest wildlife such as deer, bats and birds such as woodcock and nightjar. You’ll use bat detectors to locate and identify different bat species and discover their secretive lives. Sound recordings of New Forest deer and bird calls, together with field guides and photographs will help you get the most from the walk. Start times for evening walks vary throughout the season to allow a return time just after dusk. 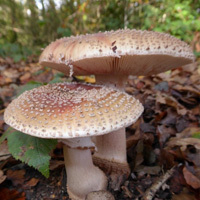 Join us on a walk to find out how to forage a feast from the Forest. We will look for and identify hedgerow fruits, berries and woodland wild foods. For families, activities include making leaf gathering parcels, a forager’s charm and an ‘I-Spy’ challenge. There will be opportunities to taste wild food jams and syrups brought along on the day. This is an educational walk and there will be no collection of fungi to eat. September, October and November An introduction to the mysterious and secret world of New Forest mushrooms and toadstools. Meet the ‘Fungi family’ to learn how to identify and group the more common fungi and discover how fairy-tale toadstools get their spots! No fungi is collected to eat. Games and challenges include: mushroom roulette, mushroom murder mystery, fungi top trumps and ‘true or false’ fungi name game. Walk times are flexible. Introductory walks start at around 2 hours, which is usually a short 1.5 – 3 mile circular walking route. Our knowledge of the Forest will help select a route and start point suitable to your location, abilities and interests. For costs please go to our prices page.